Though it may be several decades before the first humans set foot on Mars, some scientists believe they've got the next best thing  a perfect rehearsal space, right here in Canada. A group called The Mars Society has built a $1.2-million US research station in the Canadian Arctic where the evironment is similar to that on Mars. The Flashline Mars Arctic Research Station (MARS) is the world's first fully-simulated Mars base. Located in northern Canada, the station was built to study equipment and strategies that would be used during a mission to the Red Planet. The Mars Society, a Mars exploration advocacy group, leads the $1.3 million US project. The group is working in collaboration with the Haughton-Mars Project, a NASA-led program also studying the Haughton Crater in hopes of learning more about the landscape on Mars. The station allows scientists and engineers to test everything astronauts would need during a mission to Mars, from water-recycling methods to land rovers and drilling equipment. The station also simulates the self-contained, isolated environment that visitors to Mars would experience. The research station is eight metres (27 feet) in diameter and has two decks. The facility includes sleeping quarters, workspace, a laboratory, an exercise room, a gallery and a sick bay. There is also be an inflatable greenhouse and garage linked to the main building by an airlock. Most of the station is be solar powered. The research will be located on Haynes Ridge in the Haughton Crater, the world's most northerly crater. The crater was formed when a meteorite struck the Earth 23 million years ago. The impact of the blast was many times more powerful than a nuclear explosion, leaving a 20-kilometre-wide depression on Devon Island. Devon Island is a 54,100 square-kilometre island between Baffin and Ellesmere Islands in Nunavut. The site is an almost-perfect imitation of the environmental conditions on Mars  a cold, bleak desert of rocks, frozen rubble, dry streambeds, and deep canyons. Daytime temperatures are similar to summer days on Mars although the atmosphere on Earth is about 100 times as dense as the atmosphere on the Red Planet. The Mars Society is a non-profit international lobby group with the goal of promoting the exploration and settlement of our solar system's fourth planet. The group's 2,400 members include a combination of serious scientists and science fanatics from more than 30 countries. The society was founded in 1998 by Robert Zubrin, who wrote the book The Case for Mars: The Plan to Settle the Red Planet and Why We Must. 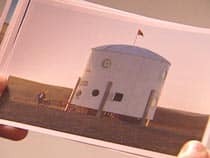 With its own research station on Devon Island, the Mars Society extends the efforts of the low-budget Haughton-Mars Project. The Mars Society raised the $1.3 million US for the project through sponsorships from companies like Flashline.com. The Internet company donated $175,000, giving the habitat its full name, the Mars Society Flashline Arctic Research Station. The Haughton-Mars Project (HMP) is a NASA-led field research program studying the Haughton impact crater on Devon Island. The frozen, rocky, desert landscape of the 20-km-wide crater is like having a piece of Mars on Earth. The HMP will give scientists an insight into the geological evolution of Mars, the effect of meteorite impacts on Earth and the possibilities of life in extreme conditions. The study will also test technologies, strategies, human factors and hardware designs relevant to the future exploration of Mars. The project began in 1997 and runs on an annual budget of $200,000.